Earlier this week there was a quote from Siado Berahino, footballer, who said that the low level of a drug (MDMA or ecstasy) found in his urine sample showed that his drink was spiked and he didn’t intend to use it. The footballer was found to have used MDMA in a Football Association internal test and banned for 3 months last year. He claims that his drink was spiked in a nightclub and that he never intentionally used the drug. Yesterday there were claims that Jamaicans (possibly others as well) had failed doping tests in Beijing, but the level of the drug clenbuterol was so low it must be contaminated meat. The International Olympic Committee decided not to investigate further due to the low levels. I’ve seen this kind of quote many times before, from sports people and in other drug testing areas. The person who has failed a test seeks to play down the positive test by saying the result was so low that it must have been due to contaminated supplements, food (f or example a nice big steak) or a spiked drink. This is a flawed premise for several reasons and unfortunately the claims have no real basis. A urine sample is a snapshot in time. The problem we have is that the single snapshot is not sufficient to interpret how much of a drug has been used. The low level he says was detected could be due to a low level of use of the drug, or a medium level use or even a really high dose! The difference will be at what time after the drug is used the sample was collected. The graph below shows a typical urine concentration over time curve after a drug is taken at time 0. 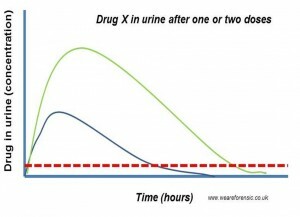 The line in blue represents the use of a single tablet dose of drug X. 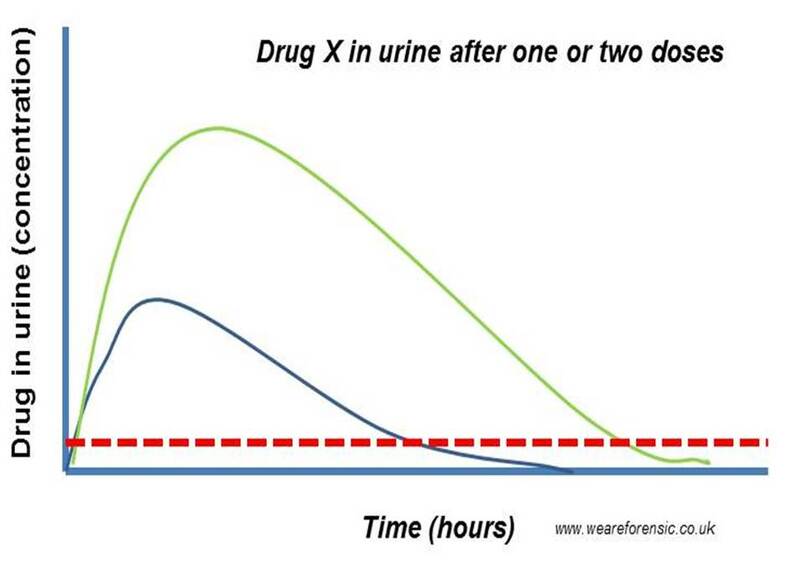 The line in green shows the curve of someone who has used two tablets of X. OK, so the high point of the urine concentration is higher with two tablets than one. OK, so fi you are comparing high levels you could say it is likely the high point on the green curve is likely to be above that from usual use of one tablet. However, you can’t tell the low levels apart. I have drawn a red line across the graph to represent ‘a low level’ of drug X. Both of the concentration curves cross the red line twice, once on the way up and once on the way down. So they both get low values but depending on how long after the drug was used the sample was taken. The Jamaican samples are claimed to have been from contaminated meat which would only have very low levels in. As seen above the very low level alone would not be enough to convince me that the sample was due to contamination. Clenbuterol has been used in farming to get cows bigger and improve their yield of meat and others have used that excuse. The way to help prove that claim would be to have multiple samples taken from the same athletes for several days before and after the samples that were positive. If all or only some of these had very low levels in you could conclude that a larger dose had not been taken as the concentration did not go up higher as in the curves above. If it was in some samples but not others it may be explained by either inadvertent or indeed a deliberate low use of the drug. This brings me onto the final point. Berahino said that the analysis of his sample proves he didn’t intend to take the drug. He said the results prove that he was spiked. I am not aware of a test that can prove either of those. Once a drug is in the body it is treated the same whether it was taken deliberately or not, the body doesn’t care whether it was in a spiked drink or not. This means there are not markers for who put it there* and certainly no markers for intent! Interpret a single snapshot with caution. It’s like trying to say what has happened in a film just from a freeze frame. * For some drugs the route of administration can be determined from the products in the body (eg cocaine smoked can give a product not seen when snorted). but as you say this exoneration maybe only possible because players were tested several times over a short period rather than having a single sample in isolation. Also possible in China? Be careful what you eat! Thanks Christiaan, I agree it is a real thing, it looks like China and Mexico have a particular issue, amongst others. It looks like they went for a blanket 1 ng/mL threshold for these retested samples. Will link to Wada press release when at home!